His Highness Sheikh Mohammed bin Rashid Al Maktoum, the Vice President, Prime Minister and Ruler of Dubai attended this evening a ceremony to honour winners of the 2nd cycle of the Mohammed bin Rashid Al Maktoum Horse Racing Excellence Awards for 2017. The ceremony was also attended by H.H. Sheikh Hamdan bin Mohammed bin Rashid Al Maktoum, Crown Prince of Dubai. Sheikh Mohammed watched a video that chronicles the racing events hosted by Dubai. Also shown was a film about the winners of the coveted award. Sheikh Mohammed honoured the winners, including Godolphin, which was selected as the 'Best Owner', Gun Runner, winner of the 'Best Horse' award and Christophe Soumillon, winner of the 'Best Jockey' award. The 'Best Trainer' award went to Aidan O'Brien, while the 'Lifetime Achievement' award was given to the retired trainer Criquette Head-Maarek. The event also saw Sheikh Mohammed honouring the main sponsors of the Dubai World Cup 2017. 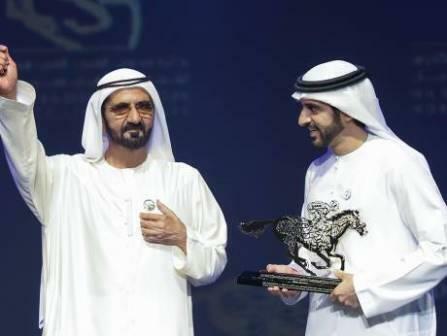 Sheikh Mohammed congratulated the winners and called on the horseracing fraternity to continue pursuing excellence and to promote the culture of breeding and riding horses as a noble sport. He also praised the initiatives and generosity of the national institutions and businesses for supporting the Dubai World Cup, which he described as an important national event that enhances UAE's global position. The ceremony was attended by a number of senior officials, as well as the guests from more than 12 countries, who are currently in the UAE to attend the Dubai World Cup.